De toegang tot Dranoutre Military Cemetery. Een algemeen zicht op deze mooie begraafplaats. 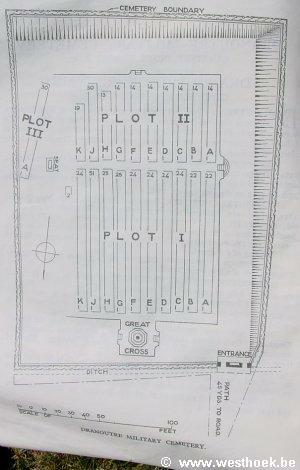 Het plan van de begraafplaats Dranoutre Military Cemetery. Dranoutre Military Cemetery is located 11.5 kilometres south of Ieper town centre, on a road leading from the Dikkebusseweg (N375). From Ieper town centre the Dikkebusseweg is reached via Elverdingsestraat, straight over a roundabout onto J.Capronstraat (for 30 metres), then left along M.Fochlaan. Immediately after the train station, the first right hand turning is the Dikkebusseweg. On passing through the village of Dikkebus the road continues for 6 kilometres to the village of Loker. Continuing through the village of Loker the road becomes Dikkebusstraat, which runs for 2 kilometres to the village of Dranouter (previously Dranoutre). 50 metres before Dranouter village lies a right hand turning into a semi residential area. The Cemetery is located 50 metres after this turning on the left hand side of the road. 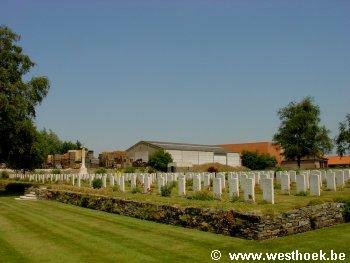 Dranoutre was occupied by the 1st Cavalry Division on the 14th October, 1914. It was captured by the Germans on the 25th April, 1918, in spite of the stubborn resistance of the 154th French Division, and it was recaptured by the 30th Division on the 30th August, 1918. In 1923 it became necessary to move 19 graves (Plots IV, V and part of III) to Dranoutre Military Cemetery from Dranoutre Churchyard to allow of the rebuilding of the church. 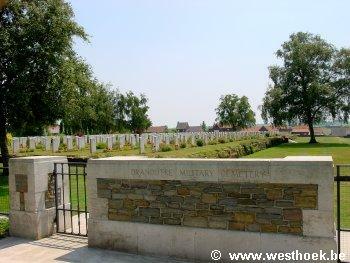 Dranoutre Military Cemetery was begun in July, 1915, and was used by fighting units and field ambulances until March, 1918. 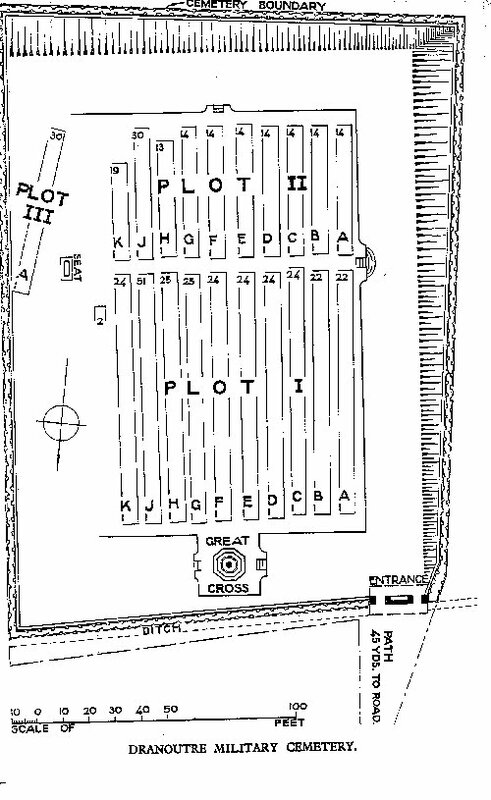 Plot III was added in September and October, 1918; and Plot II, Row K, contains the 19 graves brought from the Churchyard. A large proportion of the burials were carried out by the 72nd Brigade (24th Division) in April-June, 1916. There are now over 450, 1914-18 war casualties commemorated in this site. Of these, a small number are unidentified. The Cemetery covers an area of 3,808 square metres and is enclosed by a low wall.